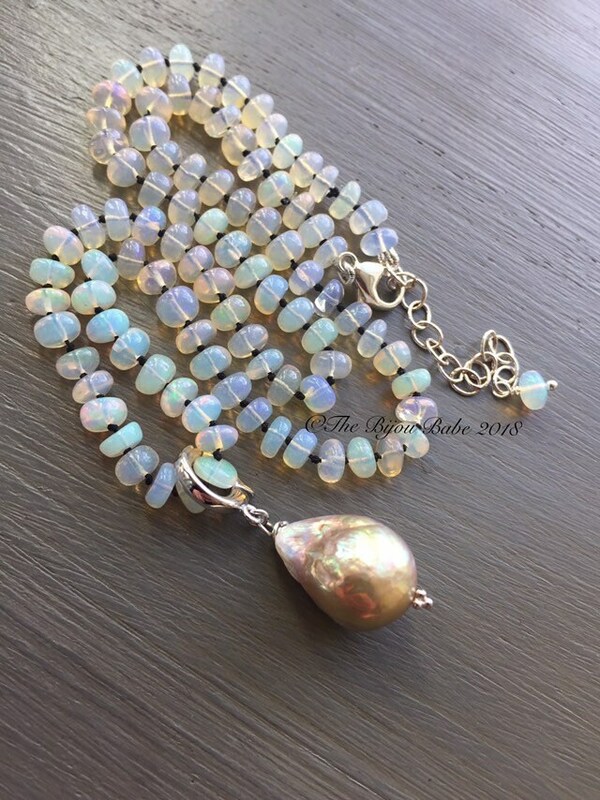 Hand knotted on black silk cord, these Ethiopian opal rondelles simply glow! Each rondelle is strung, and then individually knotted on the cord, giving this necklace a lovely, fluid drape. Measuring approximately 5mm, the rondelles are a perfect size for either wearing as a single necklace, or layering with other pieces. 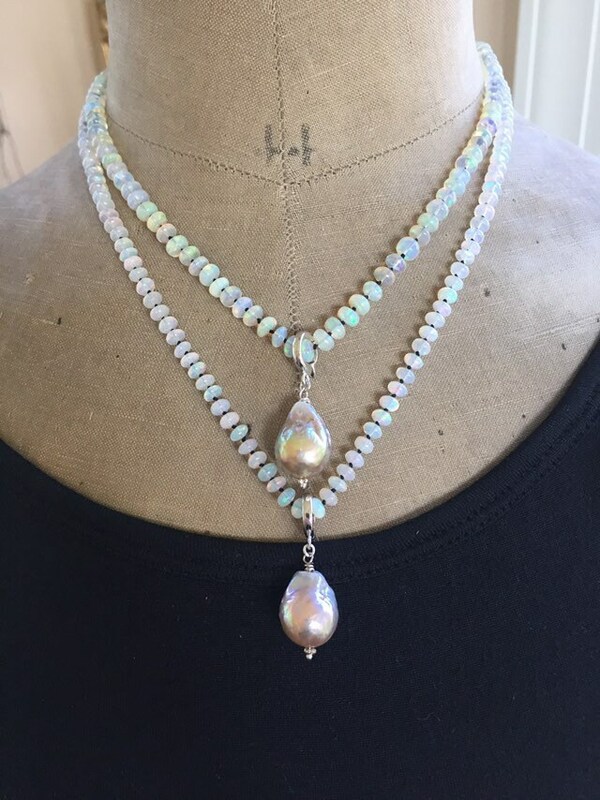 For versatility, the focal is a "pondslime" baroque pearl set in sterling silver on a removable bail. 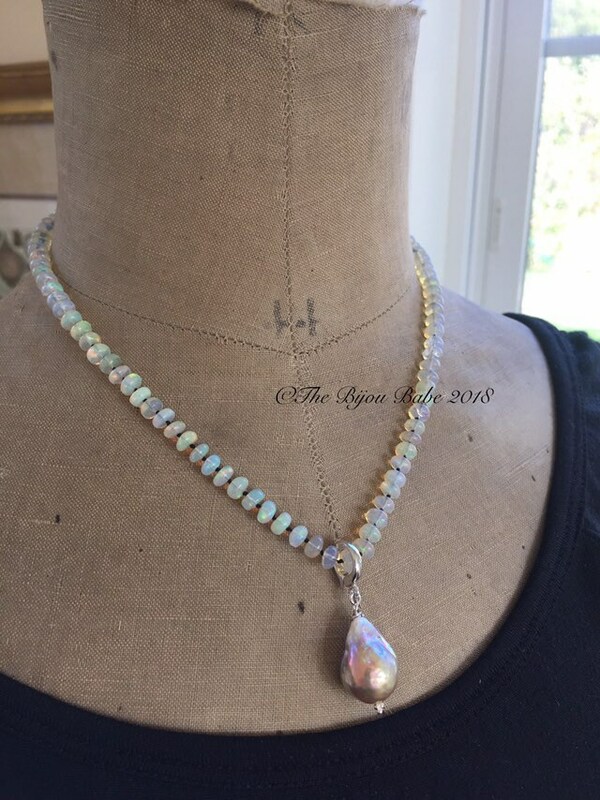 Detach the pearl by unclipping it from the opals when you want to wear the necklace without a focal point. 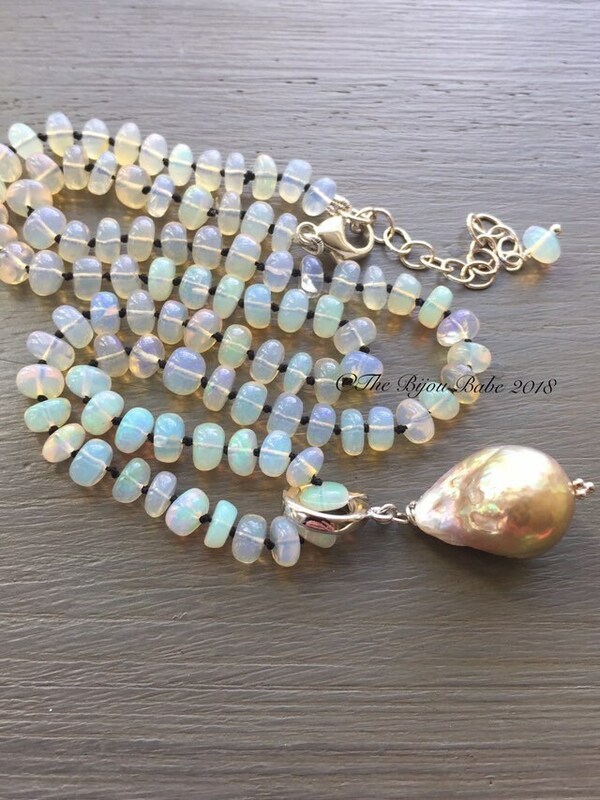 Opals are wonderful and unusual in that they tend to pick up colors that they are near. 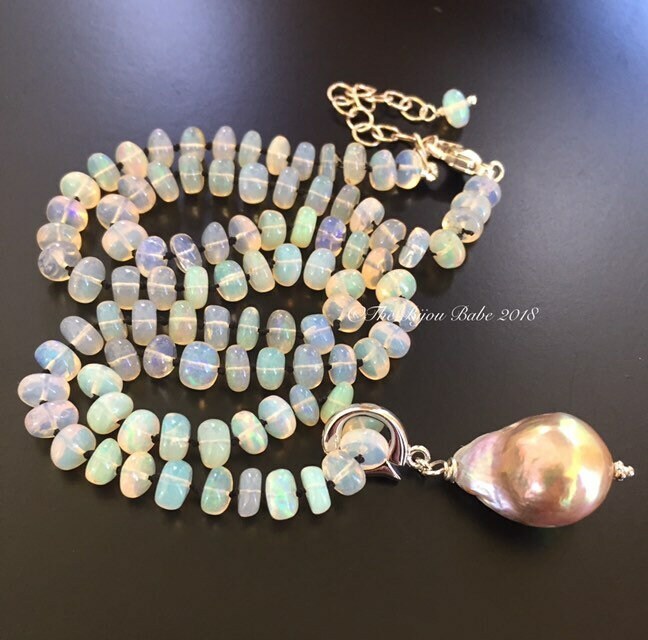 All photos are taken in natural light, and have not been enhanced, so that one can see the difference in how light and backdrop colors enhance and affect the color of these amazing stones. 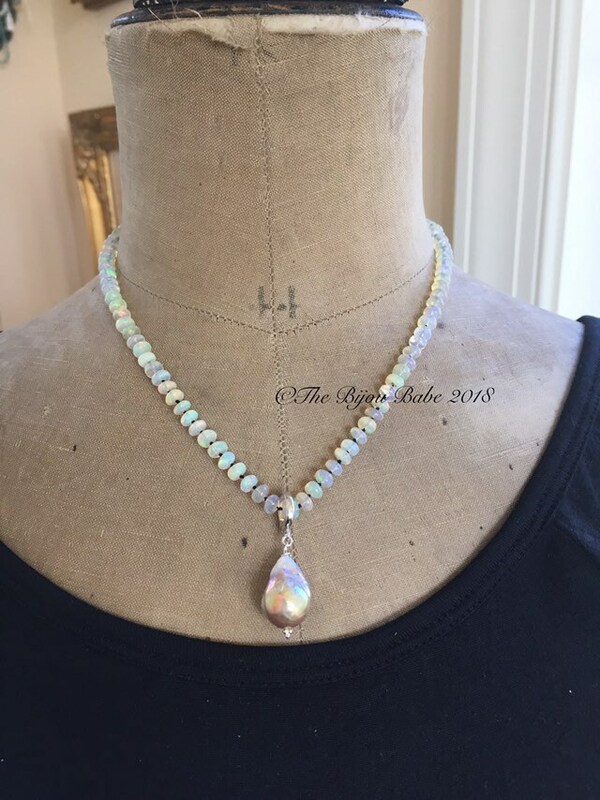 Your Ethiopian opal necklace will ship USPS Priority Mail in the US, and will be packaged in a lovely gift box tied with ribbon. Postage rates for international shipping do NOT include tracking and insurance. Please contact me if you wish to upgrade your service. I recently purchased this necklace for my wife as an anniversary gift. SHE ABSOLUTELY LOVED IT!! It arrived quickly, was well packaged and was more beautiful than the pictures. I would highly recommend Ms. Susan and would definitely purchase from her again.